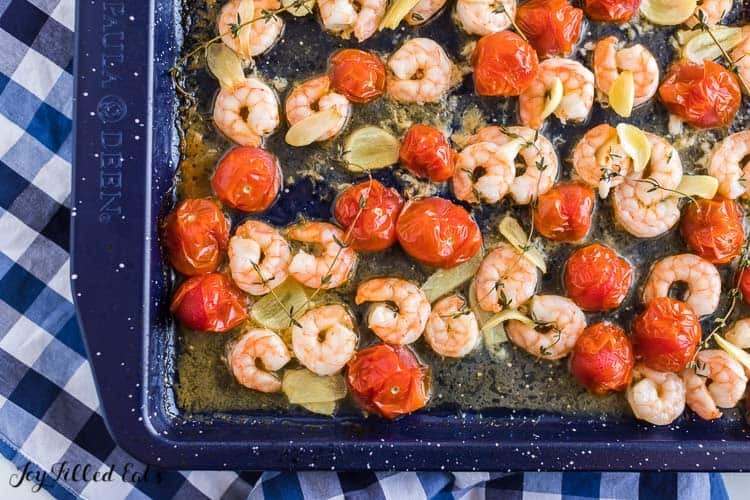 Sheet pan oven baked shrimp with garlic is the perfect weeknight no-fuss meal. 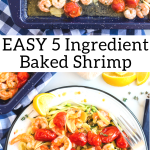 The simplest ingredients can transform into a culinary delight, and that is what you get with this baked shrimp recipe. I love shrimp. I posted a few weeks ago about my husband bringing me a two-pound bag as a surprise. Those shrimp are long gone. Two Friday dinners later. This is what we had with the second half of them. Sheet pan dinners are always a win. They are minimal prep, minimal dishes, and this baked shrimp is bursting with seafood flavor. When we buy shrimp, this is often a go-to recipe in our home. 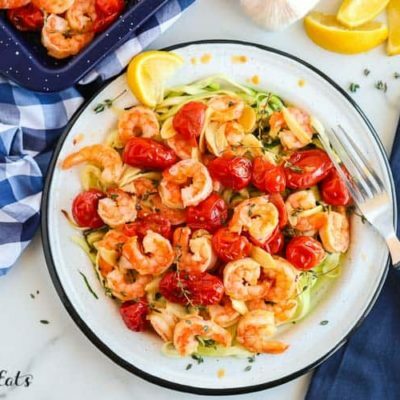 If you enjoy garlic, lemon and shrimp give this recipe a try! I think you will enjoy it. My favorite dinners are the ones you prep and then just pop in the oven. I remembered my sister-in-law doing that once I thought I’d give baked shrimp it a try. It was so easy and they came out so good. This recipe is so simple to make. You want to preheat your oven and then grab a baking sheet and give it a spritz of cooking spray. This will help to prevent the shrimp from sticking. Next add the shrimp on the tray, making sure to spread them out so they don’t overlap. Then top with the tomatoes, garlic, and fresh thyme. Sprinkle with your olive oil and salt and bake until the shrimp turns pink and is cooked thoroughly. First, I served it over cauliflower rice, but my husband was not a massive fan of the shrimp with cauli-rice. He didn’t love the texture combination. The next time we made it I served this with zucchini noodles and it was perfect. 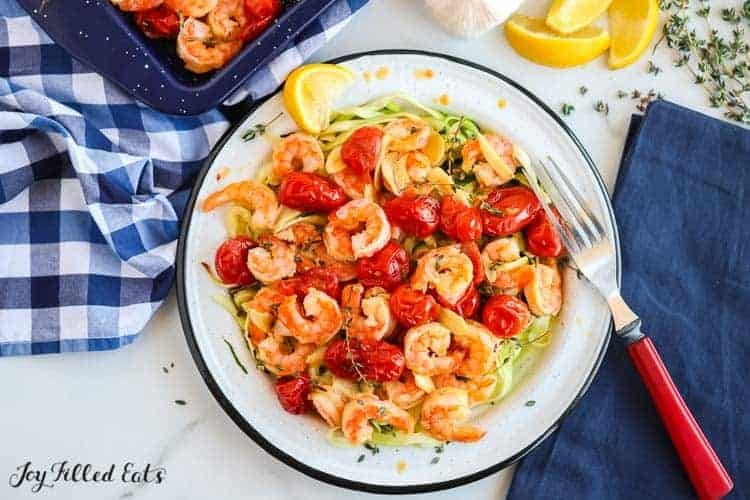 You can also serve this shrimp dish with breadsticks, biscuits, or a side salad. The jarred minced Garlic is excellent for some recipes, but this recipe is best when you mince whole garlic cloves. It just tastes way better! So I recommend heading to the store or garden to use fresh cloves. Yes! You can use shrimp with tails or no-tails, it’s all about your personal preference. When I serve this for just the family, I buy shrimp with no tails or pull them off before cooking. If I am serving a crowd of guests, I leave them on for a pretty presentation value. But you are more than welcome to go either way. 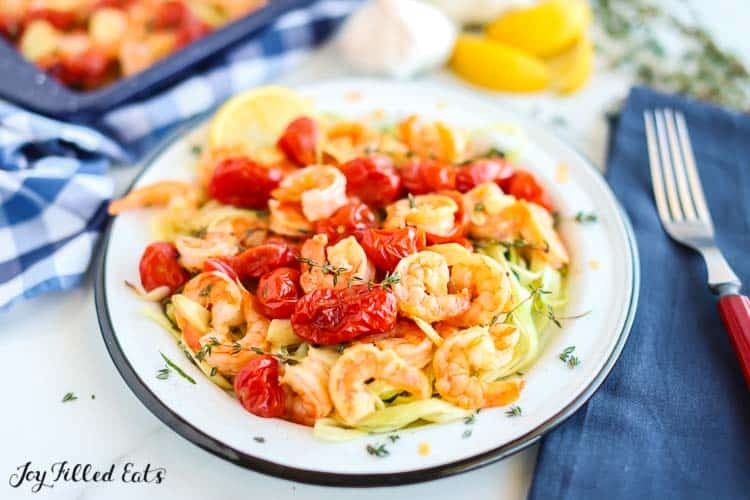 Shrimp is a low-calorie protein and is full of nutrients. The one downfall is shrimp does contain a higher amount of cholesterol. So eating shrimp in moderation is key. Shrimp contains omega-3, vitamin D and selenium and more. Since I don’t use butter to sauté the shrimp this helps it to be a more healthy way to prepare shrimp. You will want to bake your shrimp for around 25 minutes or until you see your shrimp is fully cooked. Depending on the size of shrimp you use will depend on the cook fine required. You will find when your shrimp is cooked the outside of the shrimp will offer a pink color that is slightly opaque. If the tails are still on the shrimp their tails will turn a red color. You just have to watch shrimp closely as they can go from partially done to over-done rather fast. You can use frozen shrimp that is raw in this recipe. Just make sure to thaw the shrimp before you go to cook it. Just pour in a bowl and run cold water over it for quick thawing, or place in the fridge to thaw slowly. Unfortunately no. If you use cooked shrimp meant for a cocktail style option or cold salad, it will overcook and make your shrimp rubbery. This recipe works with raw shrimp only. 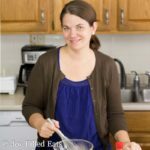 You can buy shrimp that is peeled and deveined already, but if you prefer to do it yourself or save a little money, let me help walk you through how to devein and peel your shrimp. First, start by peeling your raw shrimp. You want to grab their legs which is underneath. When you get a good grip begin to pull the legs away from the body. This will remove the shell off the shrimp as well. If you want at this time, you can grab the tail and twist it off. Or leave the tail on if you prefer. Next, you want to start deveining the shrimp. With a sharp knife, make a shallow cut down the middle of the shrimp’s back. This will expose the intestine (black). With the knife or even a bamboo skewer lift the vein out of the shrimp, and then wipe it off on a paper towel to quickly get it off skewer or knife. Once you peel and devein your shrimp, I recommend rinsing under cold water to wash off any residue on the shrimp. Then pat dry and prep for the baked shrimp. I always recommend rinsing your shrimp because sometimes you will find that a little sand or dirt on shrimp that hasn’t been peeled or deveined. Try this oven baked shrimp with garlic recipe and then leave a comment letting me know what you think! 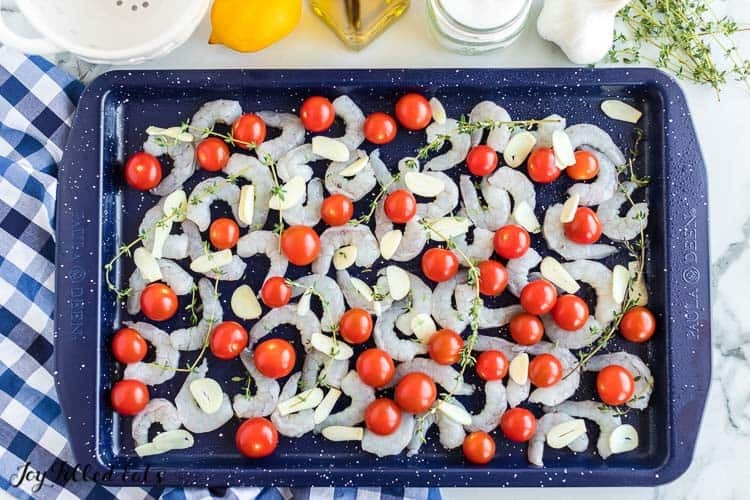 Sheet pan baked shrimp with garlic is the perfect weeknight no-fuss meal. 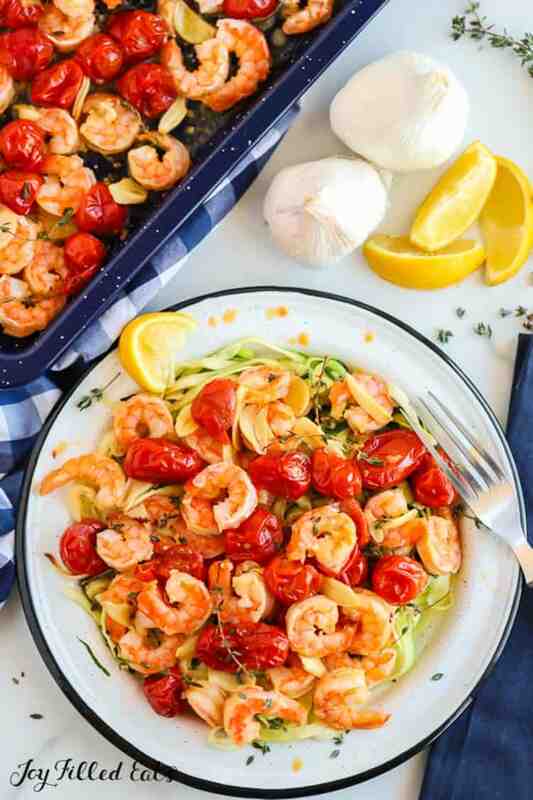 The simplest ingredients can transform into a culinary delight, and that is what you get with this baked shrimp recipe. Preheat oven to 400. Spray a rimmed baking sheet with cooking spray. 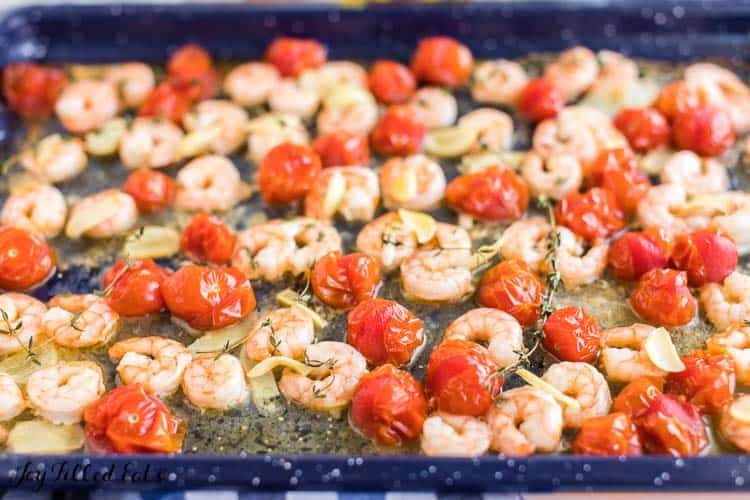 Put the shrimp on the tray and top with tomatoes, garlic, and thyme. 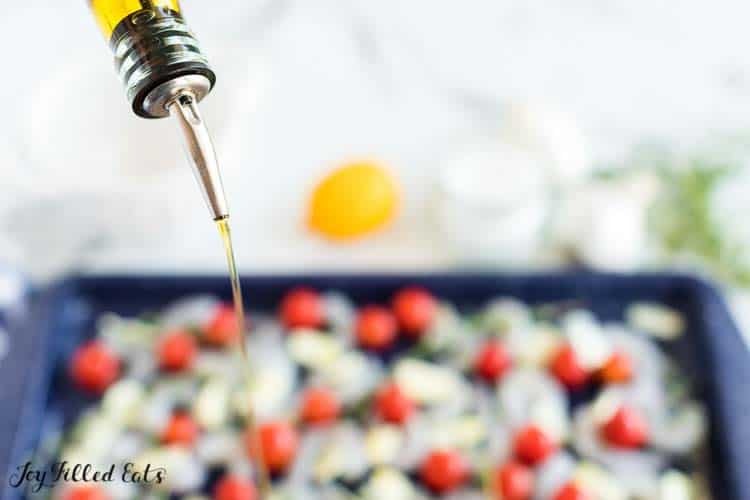 Sprinkle on the salt and drizzle on some olive oil. Bake for 25 min until the shrimp turn pink. Originally Published March 24, 2016. Revised and Republishes April 18, 2019. I don't know how it took me so long to jump on board but sheet pan meals are my new favorite thing! We have at least two on our meal plan for each week so I was thrilled to find this tasty shrimp option (hubs LOVES shrimp). The whole family loved this and the leftovers were great for lunches! Easy & Delicious! Thanks for sharing!